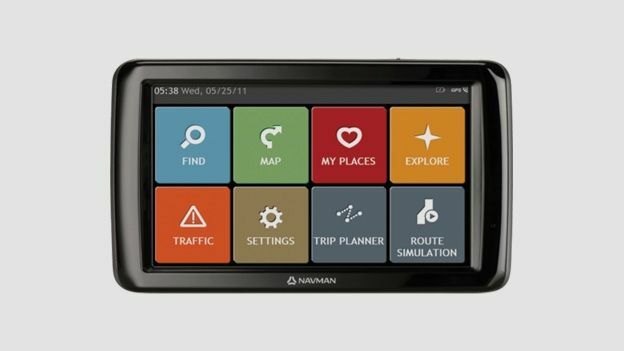 While the rise of satnav smarphone apps may have slowed the amount of hardware being launched, there are still plenty of satnavs to choose from such as the Garmin nüvi 3490LMT and the Navigon 92 Premium Live, but it's you're after a larger screen then the Navman Panormamic may well be the one for you. If bigger is better, the Navman Panoramic's got it nailed. The huge seven-inch touchscreen display makes for mapping on a grand scale. That's a good thing if you like the look of the latest big-time screens being built into the new cars but baulk at the thought of having to buy a whole new vehicle just to have a larger navigation display. Google searches, HD traffic services and Bluetooth support are notable by their absence. But objectively speaking, a seven-inch nav with a fat Euro map pack seems like a a great deal for just £129. What's more, if the huge display isn't enough of an aid to promised navigational clarity, spoken street names add an extra layer. Then there's the unfathomably flexible docking arm, which gives you about as much control of placement and viewing angles as is likely possible. It's sturdy, too, which is critical in-car. Big screens are a bit of a broader trend, what with smartphones accelerating well beyond four inches. Given that the Navman Panoramic is designed to be used as a more or less fixed installation in-car rather than a pocketable or generally portable device, why not up the screen acreage? Problem is, the poorly chosen colour scheme of the mapping undermines the legibility of the maps. The graphics are certainly attractive, but they lack contrast and that makes the maps pretty tricky to absorb at a glance. With a resolution of 800 x 480, you don't actually get any more pixels than much smaller navs, like the 4.3-inch Garmin's nüvi 3490LMT. The bad news is that those large, lovely maps get the better of the Navman's modest CPU power. The frame rate is positively glacial. Likewise, and the resistive touchscreen isn't the most responsive. Despite an interface that majors on large, user friendly buttons, therefore, it all adds up to an infuriatingly sluggish overall experience. The computerised text-to-speech is pretty clunky, too, which you won't enjoy if you like using audio navigation prompts to minimise how often you need to look away from the road. You get maps for 44 European countries along with multiple routing options that include the fastest, most economical, shortest and even easiest options. It's pretty hot to trot when both initially calculating routes and re-routing on the fly. OK, there's no fancy traffic data displayed on the maps. But for the money, it's a great deal. At this price point, something has to give and we'd actually be willing to tolerate most of the Navman Panoramic's shortcomings. But the sluggish performance and lack of mapping contrast undermine what ought to be its biggest advantages – readability and ease of use. That, needless to say, is bad news for a device that trades on its big screen to deliver a great navigation experience.